Just this week I was checking out a resource that a well-meaning person passed on to me. It’s a non-profit whose mission is to provide support for parents of, and members of the LGBTQ+ community. Perfect, right? How thoughtful for this person to think of me when they met one of the people who founded it. These are the kinds of connections I am hoping to make and to be able to share with you. As I dug deep into the website of the organization, alarms started going off, and red flags began rising. I can’t share this with my people, I thought. Here’s why. The driving idea behind what I read is that LGBTQ+ people are broken. Their guiding mission is to “offer comfort and emotional support to the parents of LGBT children, the LGBT community, and the church concerning broken sexual identity issues.” Not only do I wholeheartedly disagree with that statement; I can’t help perpetuate the idea that it might even be right. 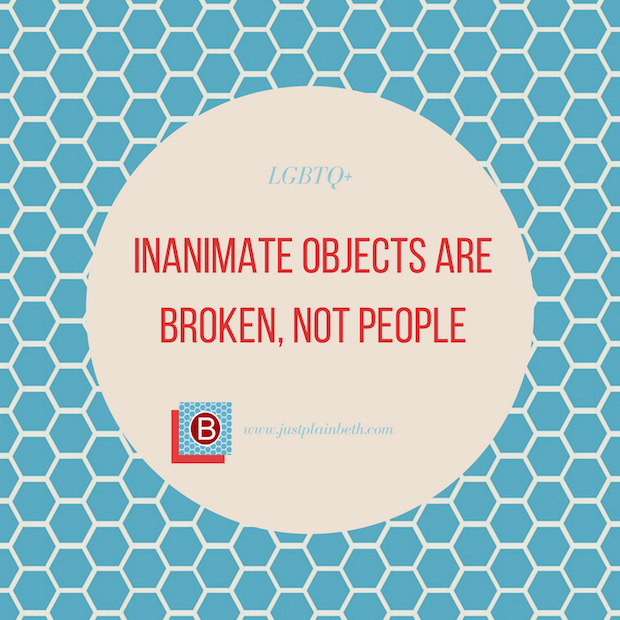 We don’t label other people as broken, so why the LGBTQ+ community? There would be an outrage if we started. Can you imagine? What if we called disabled people broken? Or people who have a mental illness? How about those suffering from a chronic disease? Or Catholics who use artificial birth control, when the Church rules against that? What about Jewish people who eat Kosher and don’t mix meat and dairy, because I don’t understand that so apparently it must be wrong and those people must be broken. Do you see how crazy all of that sounds? People in the LGBTQ+ community are just as whole as anyone else. You may disagree with their lifestyle or not approve of whom they choose to love, but that is your issue, not theirs. That does not make you broken either, but you need to be willing to recognize that your discomfort is about you and not them. Then, you can either choose to work on that discomfort, or not, but it frees you from carrying a burden of judgment. Let me say it one last time for the people in the back: people in the LGBTQ+ community are not broken. Now, this ministry that was shared with me has good intentions. The need for love, support, and encouragement IS great. Parents need resources to help them adjust to a new family dynamic, which may be completely different than any they could ever have imagined. They might have some preconceived notions that they need to work through and let go of, and the best way to do that is by connecting with other people who have been where they are. 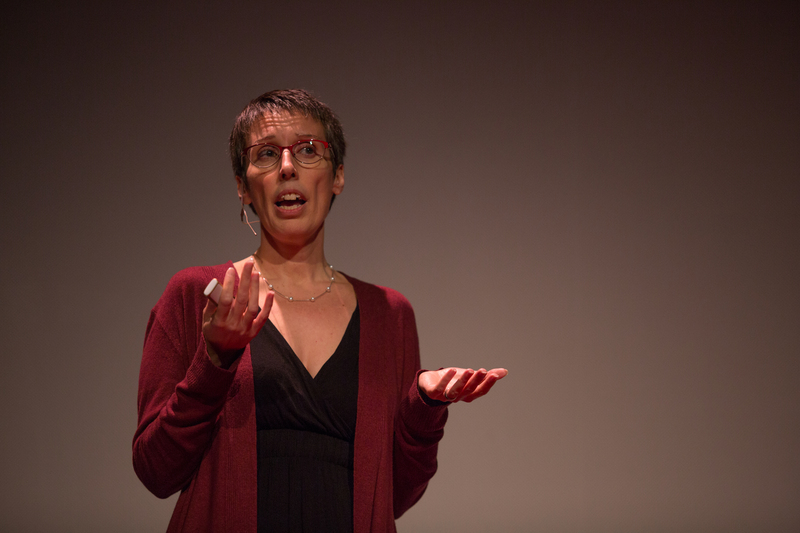 Serendipiditydodah: a group for moms of LGBTQ children of all ages, from little to grown up. It is a secret Facebook group (which means no one can see what you post and it’s not findable through the search bar). 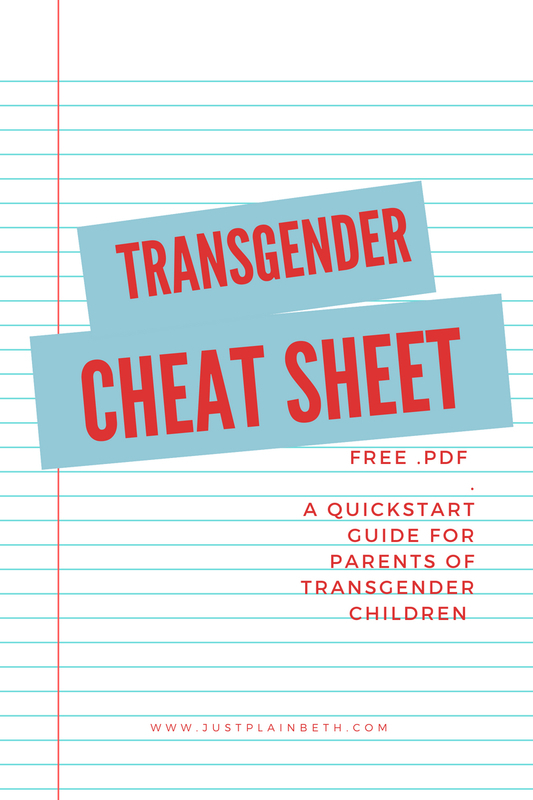 There are also three subgroups: One for moms of transgender children, one for moms who want to do acts of kindness in their local community (visit people in the hospital, provide temporary housing, send notes of support, etc. ), and one for the Ann Arbor Blue Ocean Faith community. You can learn more by clicking this link. Parents of Transgender Children: A closed Facebook group for any parent (not mom-specific, you can also be a caregiver or immediate family member) of transgender, gender questioning, gender fluid, agender or other gender-nonconforming children of all ages. There is a list of rules about what you can and cannot share from within the group that protects the privacy of the members, and an admin has to approve you before you can be added. They also have a subgroup for Allies of all of the above, as well as the adult community. You can find that group here. Fortunate Families: is a website/Facebook Page that is working to bridge the LGBTQ community and the Catholic Church together. Their mission is to share stories and engage in dialogues with the hierarchy, pastors, and parishes. You can learn more about them here at the website, and here on the Facebook page. PFLAG: PFLAG has over 400 chapters that provide support, education, and advocacy in nearly all 50 states, the District of Columbia, and Puerto Rico. They have a website, a Facebook group, and are on all major social media channels. You can get started with their organization here. I don’t know what else this website puts forth as truth, so I can’t speak to its usefulness otherwise, but just as a little side note, I see brokenness as part of the human condition. Now, if they’re talking about LBGTQ folks being the broken “them” while the rest of “us” are whole, *that’s* a problem. But fwiw, if I ever (for some reason I can’t foresee) talk about someone who happens to be both trans and broken, it’s gonna be because broken is a primary characteristic of all of us (and the reason Jesus came) the sexual identity is secondary or coincidental. actually, the Bible speaks of all of us as broken and needy often. as well as many other similar terms. 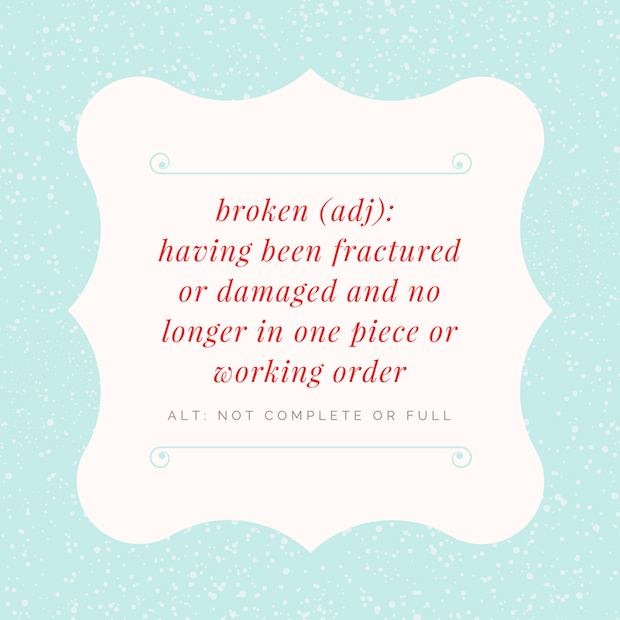 i certainly don’t think of LGBTQ people as any more broken than I am, but i do think of them as being broken just like i am. if i weren’t broken, i would have no need of GOD. I would have no need of a Redeemer. if i were totally fine on my own, i would be GOD! But i’m not fine on my own. I’m not alone in that place either. We all have our own areas of brokenness, but broken is what we are. That is why we go to Jesus. It is ike going to the doctor. I can’t get my cancer treated if i don’t first recognize that i am sick and “broken” in some way. It doesn’t make me less-than others. It makes me wise. I go to the doctor at the first sign of my brokenness so he can help bring me back to health. As humans, we don’t help ourselves when we try to pretend that we are fine, live in denial and get to a place when medical care no longer help us. Physically, we have many warnings for most diseases. They are called symptoms. We can pay attention to them and get them treated or ignore them to our peril. The same thing happens to our spirits. We get warnings that show us the signs of our brokenness. They come in many forms. They come in the forms of our conscience guiding us and telling us that we are on the wrong track; wise friends telling us that we have lost our way; signs that close friendships are going sour because of our behavior; and worst of all, our ability to worship GOD is getting harder and harder to do. How do we repair those broken places? Ask GOD to help us. Repent and turn for our ways of trying to find purpose in ourselves and our desires and ask Him to show us how to follow in His ways. He will make the path clear to healing. His desire for reconciliation and healing is way stronger than our desire for it. Yes, the process of healing is not easy. But it is good. We only must decide that we are broken and need help. All of us. Not just one group of people. Everyone in the human race needs help for the broken places where they find themselves. Self-righteousness is a sign of brokenness just as much as some of the sins that are more overt. Jesus spent his time speaking our against it too. cf. story of the prodigal son. I understand what you are saying, and I don’t disagree with your point of view about brokenness. I wasn’t writing about spiritual brokenness in my post, and I don’t believe the website that I was sharing about was either. I didn’t link it because I don’t want to a. draw attention to it and b. shame them. The website I was referencing was implying that LGBTQ people are more broken than the rest of us. They referenced how they could love their gay son, but couldn’t support his being in a relationship with another man. So if he finds love like you or I am able to have, as cis-gender straight people, then he would be in need of… what? Fixing? Salvation? I’m not sure because I had to stop reading. So I think that when we talk about people being broken, we have to be careful to define what it is that we are making reference to, as you did so nicely. Thanks for reading and sharing the link!